India is the sixth largest producer of coffee in the world with about 4% share in global coffee production. India is a high quality producer of both Arabica and Robusta varieties of coffee with the coffee being grown under a canopy of shade trees in ecologically sensitive regions of the biodiversity-rich Western and Eastern Ghats. Indian coffee plantations provide direct and indirect employment to about 0.6 million persons with the processing and exports/retailing subsectors also contributing to significant employment opportunities in the country. Indian Coffee production rose steadily from 1950-51 and reached a peak of about 5 million bags (60 kg bags) in 2000-01 but subsequently slumped during 2001-02 to 2005-06 mainly on account of cumulative impacts of slump in global coffee price, the occurrence of drought, and the outbreak of pests & diseases during the period. Subsequently, the coffee sector has shown signs of recovery and the country's coffee production crossed the 2000-01 level in 2010-11and increased consistently reaching a peak of 5.3 million bags by 2012-13. By the year 2020, it is expected that India's coffee production would rise to about 6.5 million bags. Coffee is an important export commodity from India with a share of around 5% of world's exports. About 70% of coffee produced in India is exported primarily to EU-member countries. The domestic consumption of coffee is growing at about 5-6% per annum with enabling factors such as higher incomes, better awareness of coffees, and higher out-of-home consumption being supported by the industry's initiatives to establish trendy cafes and other retailing formats. India's domestic coffee consumption is estimated to have risen to about 1.9 million bags in the year 2013. Producers hope to meet the growing deman d by adopting a set of integrated and comprehensive strategies to increase coffee production in the country. Strategies to increase coffee output in the country should be based on the dual dimensions of (i) expansion of area unde r coffee cultivation and (ii) increase in productivity, while integrating issues such as scarcity of skilled farm labor and climate change. The Coffee Board has conducted extensive surveys towards identifying new tracts of land for expansion unde r coffee cultivation in traditional coffee growing states of South India as well as in under-exploited states such as Himachal Pradesh and West Bengal. Based on the findings of the surveys, a pilot program for trial planting of coffee has already been initiated in Himachal Pradesh. In the states of Andhra Pradesh and Odisha, the state governments have been promoting coffee cultivation with an emphasis on tribal development and afforestation. Increasing the productivity of coffee plantations by undertaking suitable technological interventions is a sustainable strategy that is feasible in the mid-term. Coffee-growing areas in India experience long dry spells, hot weather & excess rains during monsoon months which make it mandator)' to grow coffee under shade, placing constraints on productivity levels. Enhancing productivity would require the development of higher-yielding cultivars that are resistant to pests/diseases and stress conditions. Coffee cultivation in India is a highly labor-intensive activity requiring about 400 person-days/hectare/year for Arabica and 300 person-days/hectare/year for Robusta. In recent years, there has been a scarcity of skilled workers in plantation areas. This situation has led to partial replacement of existing Arabica tracts with Robusta as the latter requires a lower amount of labor while also being resistant to white stem borer. Although most medium and large coffee plantations in India want to adopt farm machinery to overcome the scarcity of skilled labor, the uneven terrain reduces the effectiveness of mechanization on coffee plantations. In response, the Coffee Board has launched a focused research program to evaluate technological solutions, while also providing financial assistance for small growers to adopt farm machinery. New initiatives are being implemented, such as the Mission Mode Action Program on popularizing control measures against White Stem Borer. A multi-country collaborative R&D program with the World Coffee Research for improvement of Arabica coffee is also underway. India has created a niche for itself in the international market as an origin of high Quality Coffees with value added coffee exports currently constituting about 30% of India's coffee exports. In order to increase the competitiveness of Indian coffees, the government has initiated programs incentivizing exports to high value destinations such as USA, Canada. Japan. Australia, New Zealand, South Korea and Scandinavian countries. The exciting growth in the domestic market during the last few years is creating entrepreneurial and skilled job opportunities. 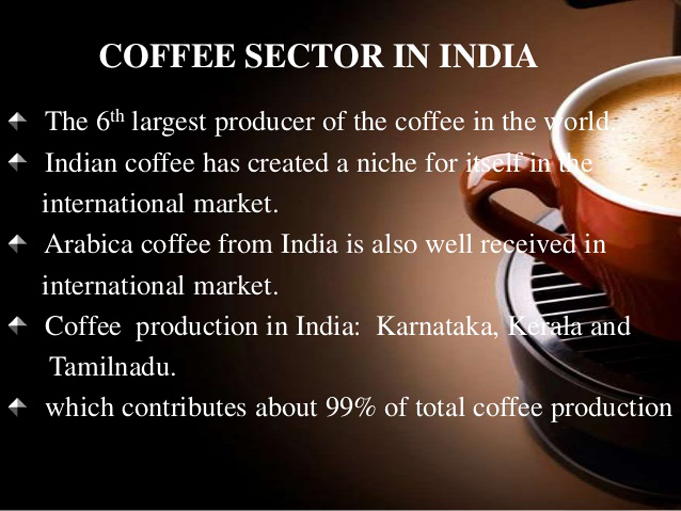 Coffee retail market in India is estimated to be 17,000,000 Rupees growing at an annual rate of 20%. The Coffee Board is conducting a comprehensive Post-Graduate Diploma in Coffee Quality Management with modules spanning the entire value chain. The Coffee Board has also been actively contributing to the growth of the domestic coffee segment by conducting training workshops for stakeholders and entrepreneurs in roasting & brewing of coffee through short-term Kaapi Shastra Training Programmes. With most leading roasters committing to procure sustainable coffees to meet most or all of their quotas, the Board has been providing assistance to Indian Coffee growers to produce certified Coffees unde r various programs. It is estimated that about 15% of the Coffee that is currently produced in India is certified unde r at least one voluntary program. The lack of active growers' collectives / producer organizations in the Indian coffee sector places limitations on the reach and effectiveness of extension services and technological innovations. Both the private and public sectors are implementing various programs to encourage the establishment and functioning of growers' collectives / producer organizations across all coffee growing regions. In summary, the Indian coffee industry is poised for exciting times ahead with rapid growth expected in domestic consumption and exports. A dynamic, evolving private sector fostered by support from the Coffee Board is expected to lead India to emerge as a trusted producer, supplier and consume r of fine coffee. While exploiting the sectors potential, it is essential that the challenges faced by the sector are well-managed regarding the issues of livelihoods, equity, and environmental sustainability.